You have just got a shinny new iPhone, iPad or iPod. The first thing you must check is whether your new iDevices' screen has defective pixels and light leakage or not. To check for defective screen, launch Safari on your iDevice and visit this post. Tap and hold on the images below (Black, White, Red, Green and Blue images) to download into your iDevice. After downloaded the images, launch Photos > Camera Roll to open these images one by one and pinch to zoom in till full screen. If the pixels on the screen shows different colour than the rest, your iDevice's screen has dead/stuck pixels. 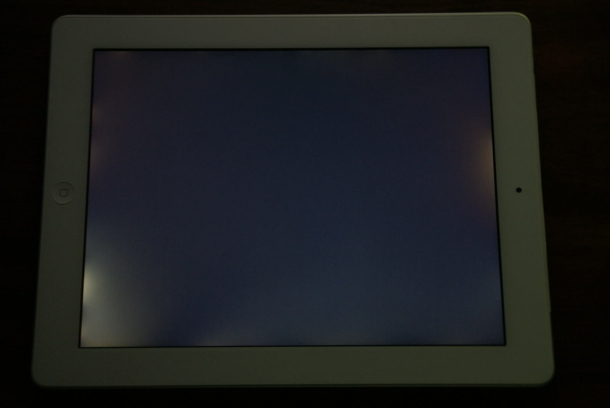 When open black image, the screen shows like the image below, the screen has light leakage. Really helpful, effective checker for dead stuck pixel.